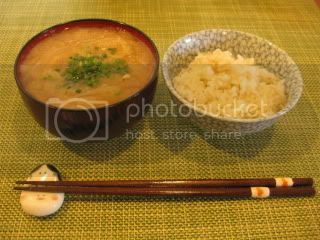 HAPPY DONABE LIFE - Mrs. Donabe's Rustic Japanese Kitchen: Typical Japanese "Okazu"
Typical Japanese meal consists of plain rice, miso soup, and a few kinds of "okazu" (small savory dishes). When I was growing up, my mom used to make 3-4 kinds of okazu every day for us. So, I try to do the same every day now, too. Plain rice (brown/ white half and half) was made with the double-lid donabe rice cooker, "Kamado-san". With this donabe, the rice is always fluffy and nicely chewy. Daikon miso soup was made with the Soup & Stew Donabe, "Miso-shiru Nabe". This donabe has the amazing heat-retention ability. All the okazu dishes I made for the evening were vegetarian dishes. 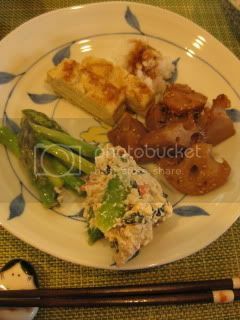 Dashi-maki tamago (fluffy omelet) with grated daikon, steam-fry lotus root (made with the tagine-style donabe, "Fukkura-san"), tofu "shira-ae" salad (creamy tofu salad), and asparagus "karashisumiso-ae" (tossed in mustard-miso-vinegar sauce). My body felt so perfectly content after the dinner.